Expat Kiwis: Herd about the Elephant Parade in Singapore? From 11 November 2011- 12 January 2012, over 160 life-sized fibreglass baby elephants, each one painted and decorated by international artists and celebrities will enrich Singapore’s cityscape along Orchard Road, Marina Bay, VivoCity, Singapore Zoo, Botanic Gardens, museums and more! 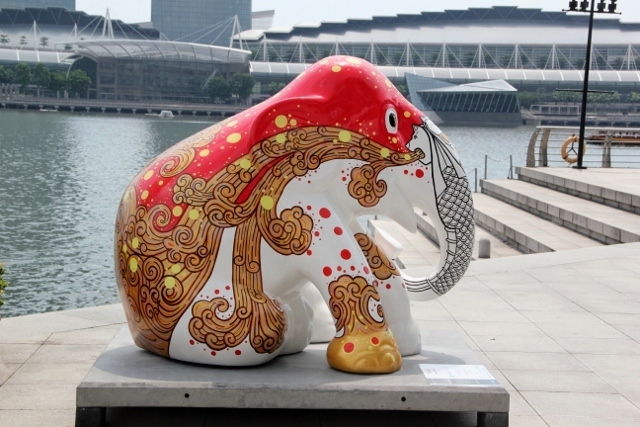 It is Elephant Parade's mission to be the world's largest financial support organization for the Asian elephant, threatened with extinction. 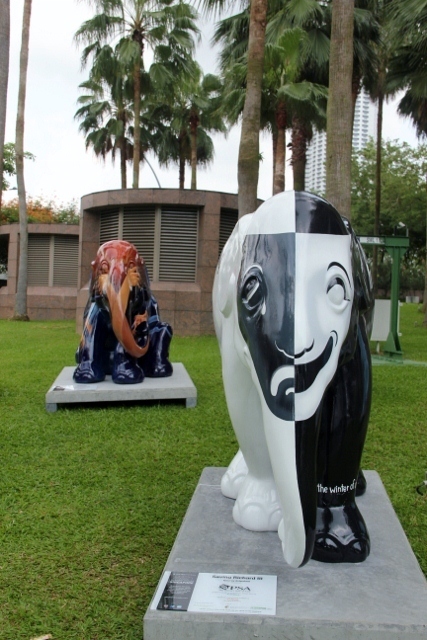 The open air art exhibitions create worldwide attention, public awareness and support for the cause of elephant conservation: the elephant statues never go unnoticed by the wider public and mass media. 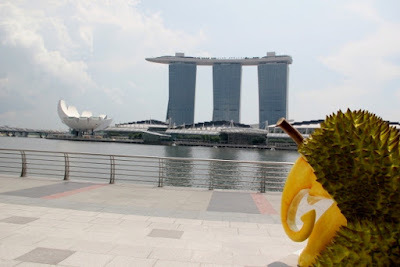 I walked around the Marina Bay area, starting at One Fullerton, Merlion Park, Esplanade, back to Merlion Park to catch a ferry (S$4) to MBS, and ended up at Marina Bay Boulevard. The following pictures taken are a selection of elephants seen along the way. I have also included underneath the pictures the names of the elephants, the artists and their ideas behind their paintings. "Cheers to all the animals in the world". "Everyone knows Singaporeans love durian! 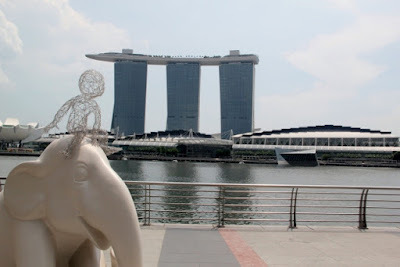 And since we wanted to create an elephant that would touch and surprise the visitors of Elephant Parade in Singapore, a huge elephant durian is the perfect piece. 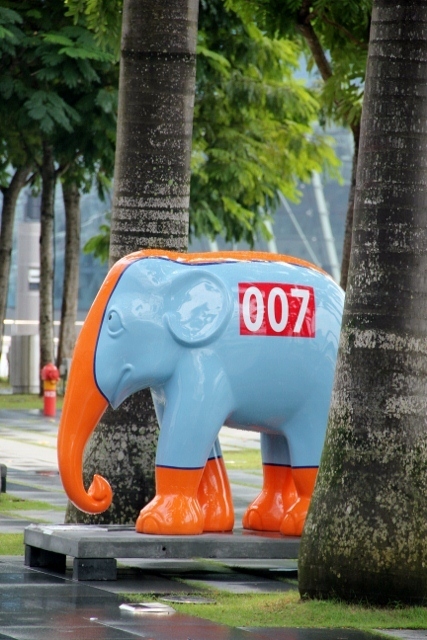 We hope this makes everyone who sees him feel our happiness in helping Asian Elephants". My Ikons are an alphabet, a contemporary hieroglyphic, a personal code, that I have developed over 20 years. The symbols are non-lingual therefore not biased and anyone and everyone could interpret them as they saw fit. The beauty of abstraction will always be self-interpretation and higher spiritual meaning. Words are precise and forms are vague. 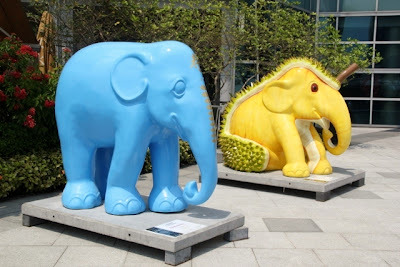 The Elephant Parade brings so much joy to the world and I hope the globe can understand and enjoy my Ikons and strive for my goal for a global oneness. 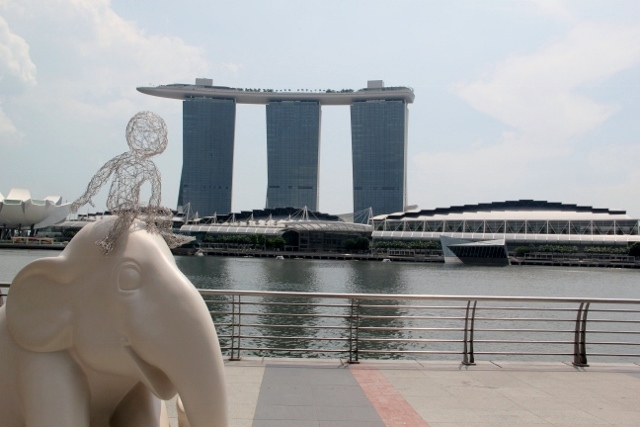 "With the child sitting on the elephant’s head, I want to show the relationship between human and animals/nature. We co-exist on this earth and have a close knitted relationship, sharing and facing the world together and are interdependent. I hope the future generations will continue to be able to experience and enjoy nature and animals. "The sea town that welcomes the first Elephant Parade in Asia". "Human instinct is wanting to break free from the mundane." "All of us at Singapore Repertory Theatre have been consumed with the production of Shakespeare’s Richard III starring Kevin Spacey, which we are presenting here as part of The Bridge Project this year. I wanted to use quotes from the play while drawing attention to the plight of the elephant. I thought it would be both playful and poignant to take a bit of artistic license with Richard’s line, “A horse, a horse, a kingdom for my horse”. "Inspiration for 'Monty' has come from Aston Martin Racing’s triumph in winning the Monterey round of the 2011 American Le Mans Series. The #007 V12 powered LMP1 car sporting the iconic blue and orange Gulf Oil livery ran faultlessly for the six hour race". 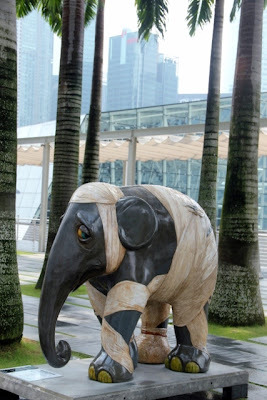 Damaged Dumbo, painted by Renato L. Barja Jr.
"After watching the current situation of elephants in a recent documentary, the inhumane acts of people towards our elephants is indeed disturbing. Although this is the largest land animal, they are helpless in today's world. 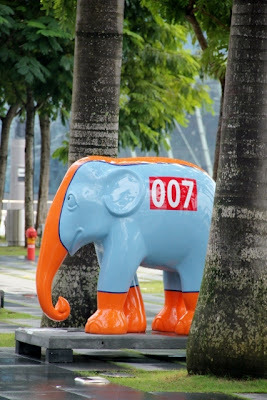 Elephant Parade is a great channel to show my sentiments that no amount of riches can justify the killing of our beloved elephants". 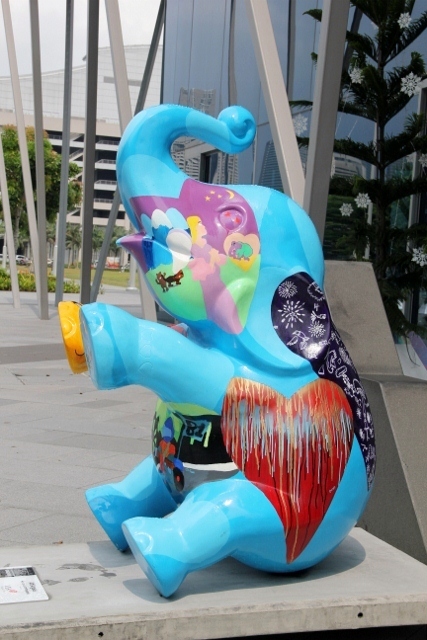 "Eight students from Very Special Arts Singapore worked together to paint our elephant in a bid to show that, despite their disabilities, they are able to contribute to a noble cause. 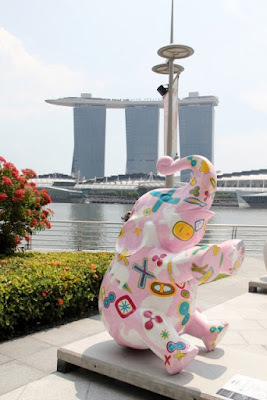 The story of Mosha touched their hearts, so each of them decided to paint a piece of themselves or a part of Singapore to brighten Mosha’s life. Christian, Daren, Ezra, Fern, Floyd, Kenneth, Qin Yuan and Trevor are children with autism, Down Syndrome or a hearing impairment, and their ages range from 9 to 27 years. Together they combined their efforts to bring an energetic composition to life, always keeping in mind for dear Mosha".